This is a guest post from Robert Warwick who has written about an event that happened in his home town in Tudor times. We are delighted to have this post – partly because we have covered Catholic persecution quite often but as yet haven’t really said much about the dreadful religious persecutions that took place under the catholic rule of Queen Mary – hopefully this post will do a bit to redress the balance. On 18th July 1556 three people were burned to death in the small Sussex town of East Grinstead, between London and Brighton on the South Coast of the UK. Their names were Anne Tree, Thomas Dungate and John Foreman. To some they were witches, to others heretics, to many – martyrs for carrying their protestant beliefs to their deaths. Ordinary people caught up in the struggle between the protestant and catholic churches after the death of Henry VIII. The five years of the reign of Mary I, also known as Bloody Mary, from 1553 saw countless deaths, but even today these three martyrs are remembered by many who live in East Grinstead. 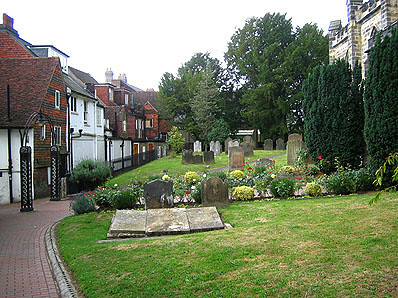 In the churchyard of St Swithun’s, on the High Street, there are three slabs to commemorate them. Even today it is not at all uncommon to see small posies of flowers laid underneath their inscribed names. The actual resting place for their ashes remain unknown, but many think that they are somewhere in the graveyard, yards away from their memorial. Just a few years ago over one hundred people turned up at a ceremony to commemorate the four hundred and fiftieth anniversary of their death. The three of them were each tied to a stake and burned alive a few paces over the road from the church just outside the gentleman’s and lady’s outfitters, Broadley Brothers, a shop that has remained almost completely unchanged for the forty years or so I have known it. Today East Grinstead is the home for 24,000 or so people, many of whom have a daily commute into London. In Tudor times things were very different. The population of the town itself was about 300, comprising of a windmill, slaughter house, a currying house for dressing leather and a blacksmith’s forge. Politically there were forty eight houses (or burgages) that were eligible to vote for the town’s two Members of Parliament. Travelling in Sussex was a hazardous business, with poor roads and the constant threat of robbery. East Grinstead was a convenient stopping off point for travellers and was a favoured location for Assizes for those judges that were too timid to venture further south. The picture this paints is of a vibrant close knit community, small by today’s standards and certainly not immune to the political and religious upheavals of the day. They were not the only ones to suffer. In the same year Thomas Hoath, a priest was also accused of heresy and executed at the hand of the state. John Smyth was excommunicated, his fate unknown. But it is the story of these three ordinary people, killed in extra-ordinary times, that still manages to capture the imagination of East Grinstead townsfolk. Although I live within a five minute walk of where the martyrs died I find it almost impossible to compare my life, and the town where I have lived most of my life, with that of the martyrs and others who lived here at the time of Mary’s reign. I think it’s the every day people, of both today and in Tudor times, that make life extraordinary and worth living. Great article by Robert Warwick, thank you for sharing it with us all. I’ve lived in or around East Grinstead for over 10 years and your historical account gave me the opportunity to reflect on how much I know about its history and how much more there is to learn. I live in Vancouver, Canada. It has been very difficult for me to trace my family roots. However, my Uncle Frank Tree showed me a picture about two years ago of the site of the Three Martyrs. 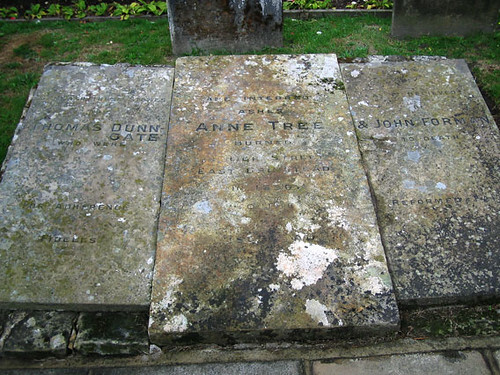 I would really like to know if my family is related to Anne Tree. Is anyone in or around the Grinstead area related to Anne Tree? My grandmother Alice Tree has traced our roots back to the Southern London area so I have a hunch that Anne Tree may be related to my family. Thank you for any information that may be of help. If anyone else can help Lance then we would love to hear from you. I am so glad to get a response! I don’t have all my records in front of me but some of what you mention sounds familiar. At the moment I know that in our family, John Tree (born July 12, 1748) married Eleanor Edwards and they had a son William Tree who in turn had a son, John Tree from Devon, England. Daniel Tree was his son and he married Ann Loveridge and they had a son and named him William Tree. William Tree married Frances Strong and they had a daughter and named her Mabel Ann Tree. On a personal note, even if I were to somehow discover that this Ann Tree of the Three Martyrs was not related to my family, I still find the story of the Three Martyrs both sad and heroic on their parts. If you ever want to text me by facebook, you are welcome to by searching my name lance mcfall. Thank you so much. It was a pleasant surprise to receive your email message. I will have to dig out my more detailed records on the Tree family. One more thing of note is that I know we had Tree family living in Ontario and Quebec before some of them moved to Saskatchewan and then eventually the Okanagan Valley. Some genealogical internet research through Ontario libraries led me to discover that a James Tree was a teacher there in the 1800’s. It leads me to wonder what it would have been like to be a teacher in early colonial Canada. did you get a reply re your Mother Tree query ? You may like to know that Ann Tree came fro thr village of West Hoathley, a few miles away from East Grinstead. There is a memorial to her in the church(St Margaret’s) there. 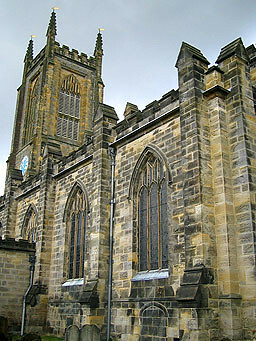 Some of the church records are available on-line. Thank you andy, Rob Warwick, and John Longstaff. Some day I’ll have to make it to England and visit the site of the three martyrs. It’s interesting that the photo of the Three Martyrs burial site was being treated like a family secret. Before my Uncle Frank Tree passed away he told me that everyone sheepishly believed that the Three Martyrs were witches. However, as soon as I started researching that photo on the internet I informed my Uncle and other family members that the three were not witches but were willfully unwilling to renounce their beliefs to accept Catholicism. 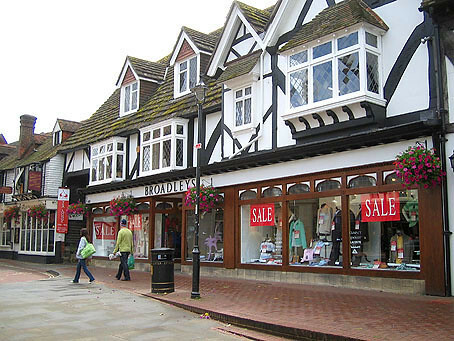 I lived in East Grinstead for 25 years and raised a family there. I returned recently for a visit with my new Italian wife and we visited St Swithuns as my wife loves old churches. We paused on our way in to the church to reflect on the memorial stones to the three martyrs, and we spoke to, I think it was a deacon, who told us that the three were burnt at the stake for refusing to give up their English Bibles. I’d never heard that before, is it true? It seems the Catholic Church at that time only allowed the Latin version of the bible and also restricted access to priests who would then interpret the bible to their parishioners. I’ve also read that only half the priests then could actually read Latin, so that might have been a problem in itself. As a by the way, my wife who is deeply catholic, was shocked by this terrible tale and spent a long time at the alter praying for these three honest christian souls. Erit reconciliatorum in pace.